Record high demand for homes, rapid redevelopment and soaring property tax rates put housing farther and farther out of reach for tens of thousands in Austin. Amidst booming development, a host of government and community organizations push back against market forces to maintain a healthy city. “Market failure is when the private sector doesn’t address a public need and this is a classic example. 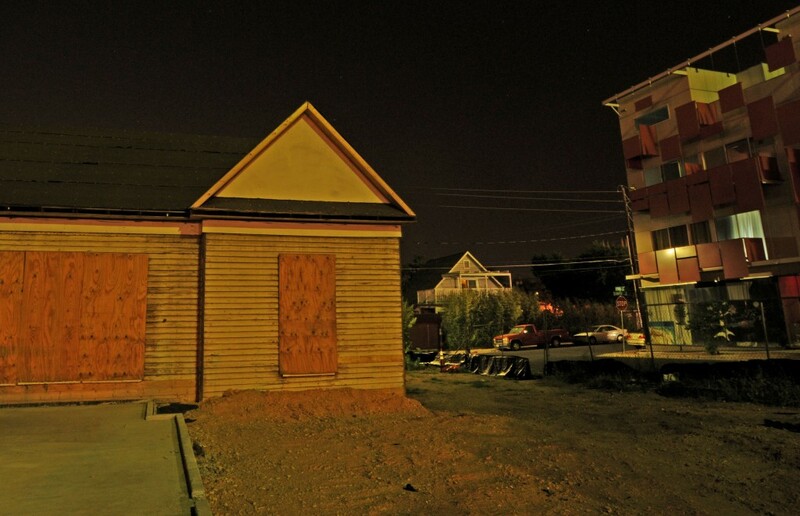 Without public funding incentivizing developers to build affordable housing they wouldn’t do it because they could make a lot more money building private sector market rate housing,” said Sean Garretson, economic developer and chair of the Chestnut Neighborhood Revitalization Corporation. As a record housing market in Austin encourages developers to buy and redevelop older homes and apartments into high class, high dollar units, the cost to live in Austin has risen while service sector wages have stayed relatively flat. Now the working incomes of over 30 percent of the city can’t afford them adequate housing selection, and even as the economy booms downtown almost 20 percent of the city lives in poverty. In response, government and community organizations in the city spend tens of millions of public dollars each year to subsidize housing costs for Austinites working in retail, food service, hospitality, and maintenance. “The free market can’t always create things because of the risk-reward value in those things so government entities or non-profits try to bridge those gaps between what the free market can provide and what’s really needed in the market place,” said David Danenfelzer, manager of development finance at the Texas State Affordable Housing Corporation, and entity created by the Texas Legislature to ensure housing for low income earners. 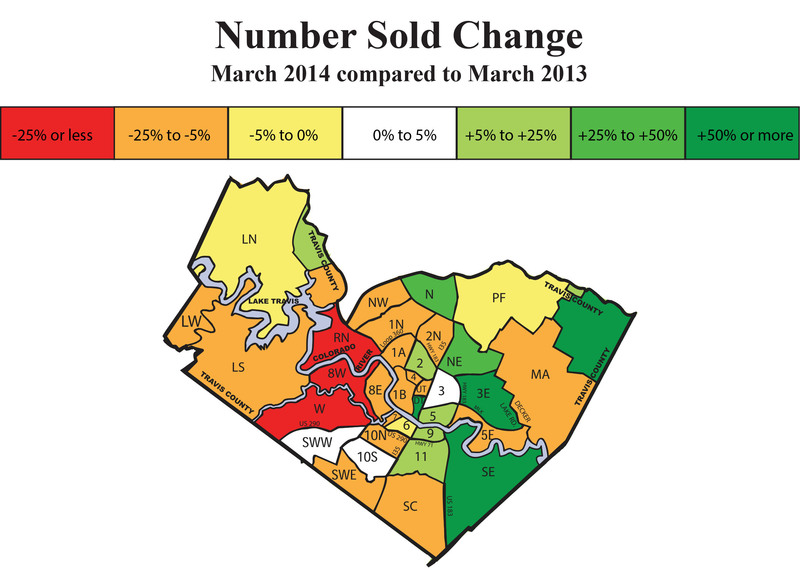 Home affordability has decreased steadily in Austin. In 1998 42 percent of homes were affordable to families earning 80 percent of the area’s median family income (MFI), but the portion fell to 28 percent by 2008, when 55 percent of families earned under 80 percent MFI. In 2014, 27 percent of city renters make under $20,000 but just 4% of rentals on the market are affordable, leaving 37,600 households no choice but to taking housing beyond what they can afford, leave the city or rely on publicly subsidized housing. New housing supply is increasingly geared towards a high-income market coming to Austin with jobs in the tech industry. “The situation’s become more dire. As we see Austin becoming more of a destination city it’s a very hot market, the affordability needs have increased and the affordability gap has increased,” said Rebecca Giello, assistant director of the Neighborhood Housing and Community Development division of the City of Austin. The Department of Housing and Urban Development considers housing cost affordable at 30 percent or less of a renter of buyer’s income. To offset market forces that would push necessary wage-workers from the city, organizations like the TSAHC and NHCD offer incentives like low-interest loans and grants for developers to build more modest units that could be rented or bought with a lower income. The NHCD used city bonds to subsidize affordable housing development by for-profit and non-profit developers against the city. In 2006 Austin voters approved the city to issue $55 million in debt, a bond, in order to collect investor money for affordable housing, and over 2,500 units available to lower income brackets have since been built across the city. 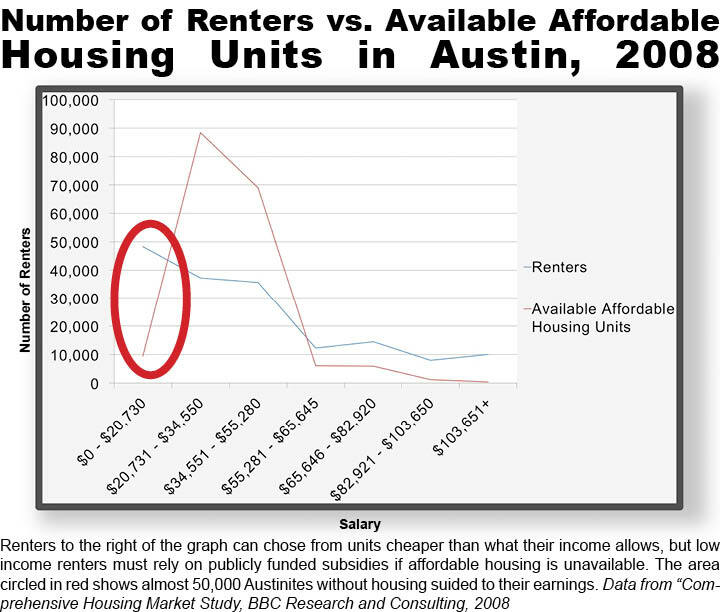 The “Comprehensive Market Study” commissioned by the City of Austin and released by BBC Research and Consulting in 2009 predicted that “to only modestly lower the current low income rental gap and meet growing housing needs, as many as 16,500 units [priced at $425 and less] should be constructed” by 2020. In 2009 the average rent in Austin was $843 and it has since increased. 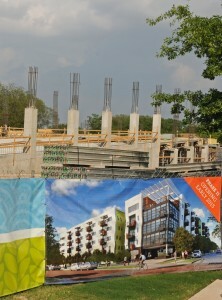 More opulent development raises tax rates in a neighborhood forcing old, lower-income residents to leave. 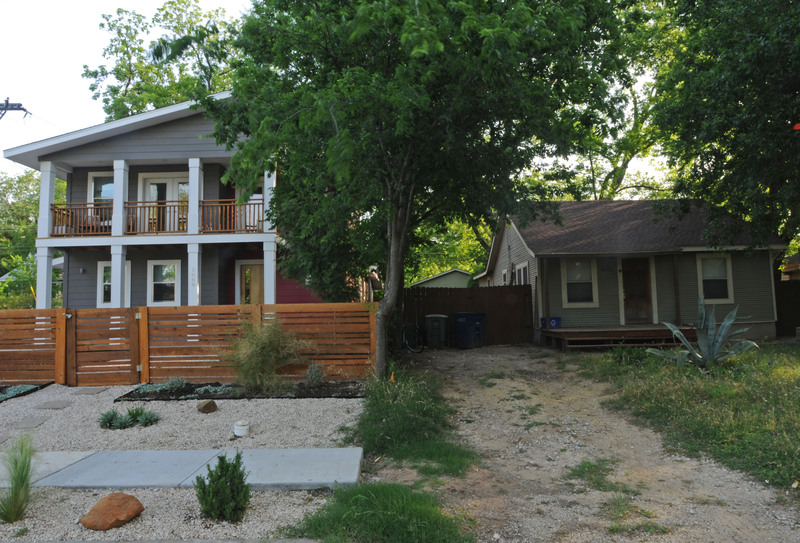 It costs between $81,680 and $187,800 to make an urban home affordable to earners making 80 percent the city’s media income, $59,433 according to a 2010 report, “Building and Retaining an Affordable Austin,” created by local groups including the Urban Land Institute, HousingWorks, Real East Council of Austin, and the Austin Area Research Organization. 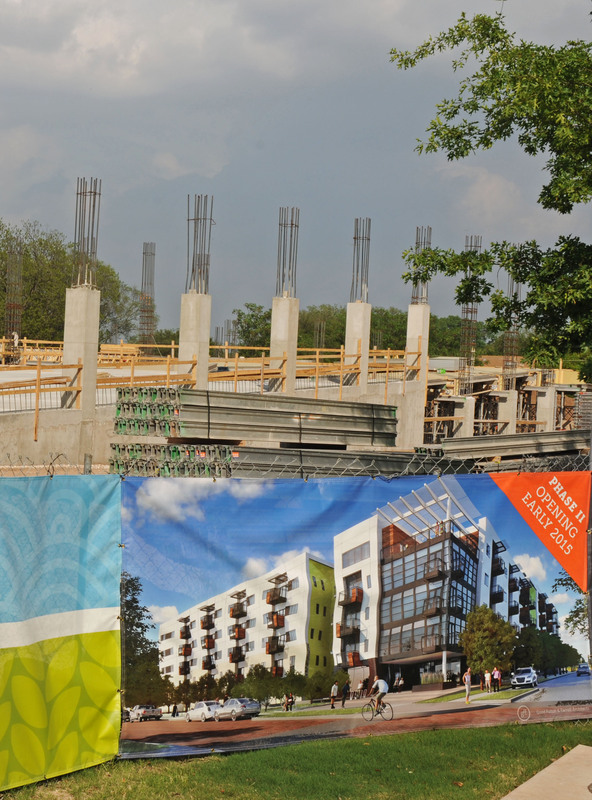 According to Garretson, developers build units that go for the highest price possible because price tags on construction vary little between homes intended for high or low-income people. The per-unit costs of purchasing property, linking to city utilizes and building are almost the same regardless of the class of home being built. The biggest differences come in finishing stages – installing appliances, flooring and interior fixtures. “Austin is a bit behind the times in offering that wide diversity of housing types throughout Austin that allows individuals of all income levels to have housing choice throughout the community,” said Giello with NHCD. Richard Troxell, president of House the Homeless and National Chairman of the Committee for a Universal Living Wage, said that taxpayer-subsidized affordable housing has become a crutch for corporations wanting to pay workers less. Even though the minimum wage can’t fund reliable housing, he said, companies like WalMart and McDonalds can pay sub-living wages because the public sector accounts for the rest with subsidies and bonds. “We are a capitalistic society. We buy things and we sell things. Anybody who’s selling something tries to cut corners and amplify their profit but sometimes there’s overreach, and that has extended from the business community out into areas where it’s totally inappropriate,” said Troxell. Without government offsetting standard housing costs, he said, many companies would have no choice but to raise wages or lose their workforces entirely. In April the Austin City Council directed its lobbyists to advocate a minimum wage increase at the next session of the Texas Legislature in January. Opponents of raising the minimum wage say it will hurt employers, kills jobs, and ultimately harm the economy. According to the City Council, 19.4 percent of current Austin residents, about 170,000 people, lived at or below the poverty line in 2012. The 2014 federal poverty line was an annual income of $11,670 for one person or $23,850 for a family of four. Older, cheaper properties are quickly being bought and demolished, replaced with expensive housing unavailable to most Austinites. In 2010 the Austin-based Center for Public Policy Priorities determined that a family of four without employer insurance needed a yearly come of $56,000 to live in Austin – about $27 an hour, 40 hours a week, 52 weeks a year. In 2014 the Massachusetts Institute of Technology said a living wage for a single adult with a child in Austin was $19.56, or $8.60 for a single adult alone. 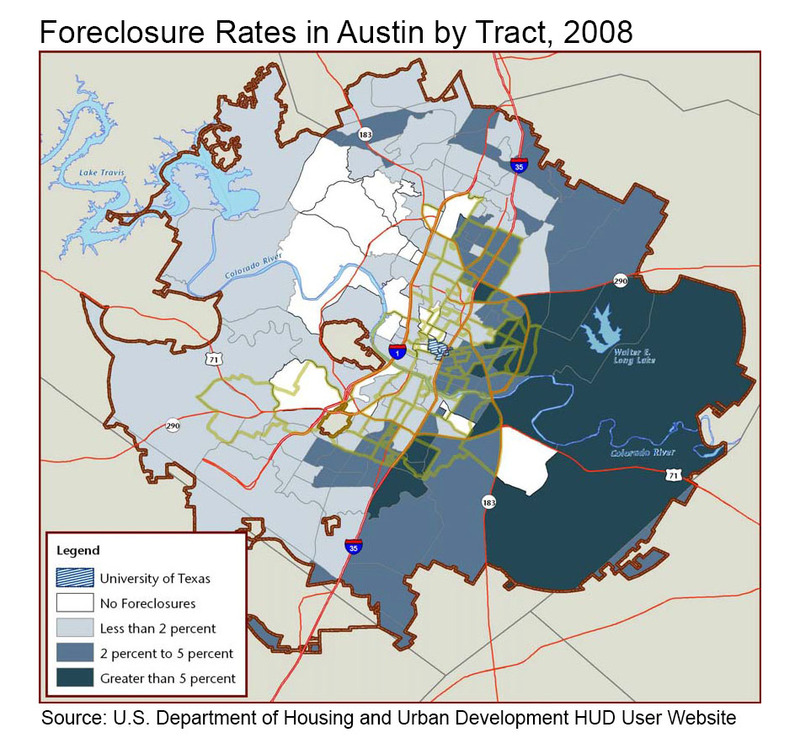 The 2009 Comprehensive Housing Market Study determined that 55 percent of Austin households earned under $56,000 a year in 2007. In addition to issuing public bonds, TSAHC works with banks and other institutions to fund lower cost housing. Banks loan to TSAHC at a fraction of market interest rates, and the corporation loans that money to developers at a slightly higher but still less than market rate cost. “The bank is able to make a philanthropic investment, we’re able to supply a product to our partners and a developer is getting money for a lot less than they would get it on their own,” said Janie Taylor, manager of development and communications at TSAHC. Banks also invest in housing subsidies to stabilize the market and reduce foreclosures said Danenfelzer. Without the subsidies, working-class families could be forced to buy housing beyond their ability to afford, setting the stage for a market crash like in 2008 when a rapid influx of foreclosures toppled the housing market and left banks in possession of thousands of homes worth a fraction of what they had loaned buyers to purchase them. 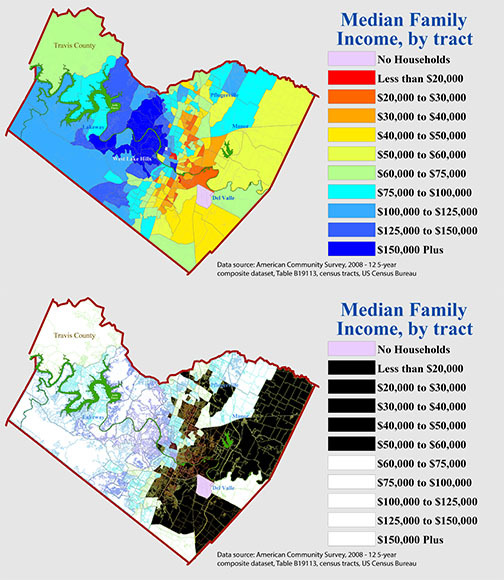 Median family income per census tract in Austin. It’s 2:00 on a Wednesday. 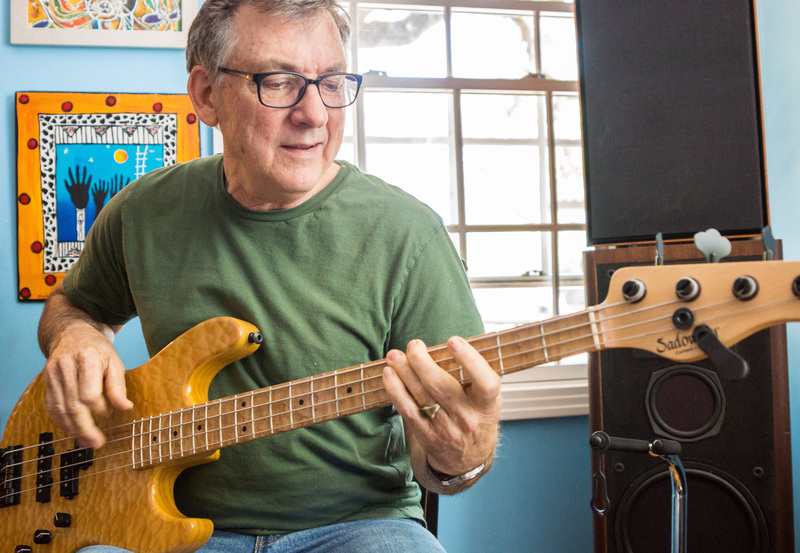 Hank Card, Conrad Deisler and Bruce Jones sit in a small, corner room of Jones’ house in South Austin tuning guitars and chatting about the fancy coffee machine in the kitchen. The walls are lined with old records, performance posters, and even an African fishing spear that was given to Jones years before. He turns off the Duke Ellington that has been flowing through the speakers and the men look at each other. 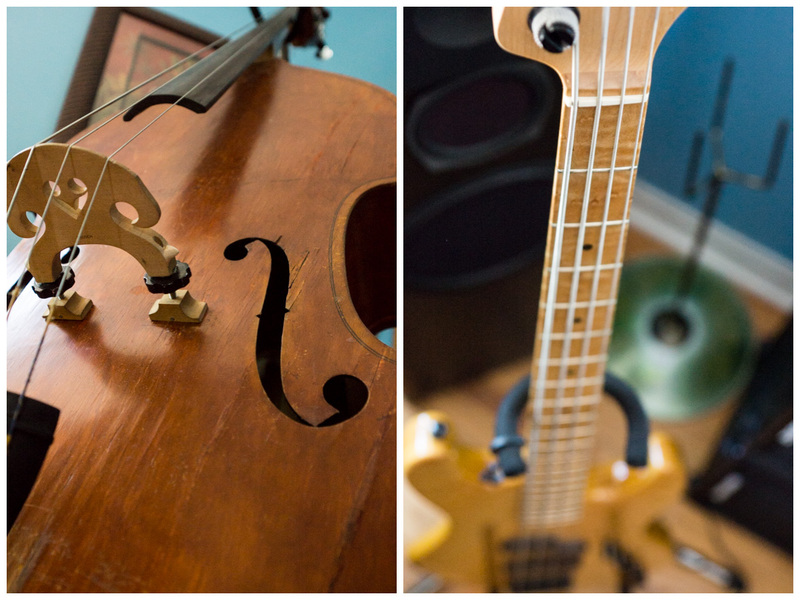 This room, in this house, is an artistic haven. 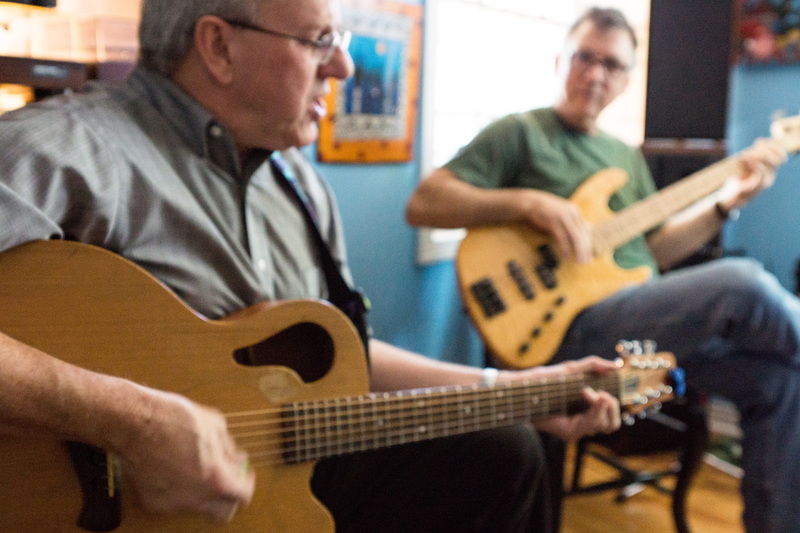 And it is a rehearsal space for the Austin Lounge Lizards. 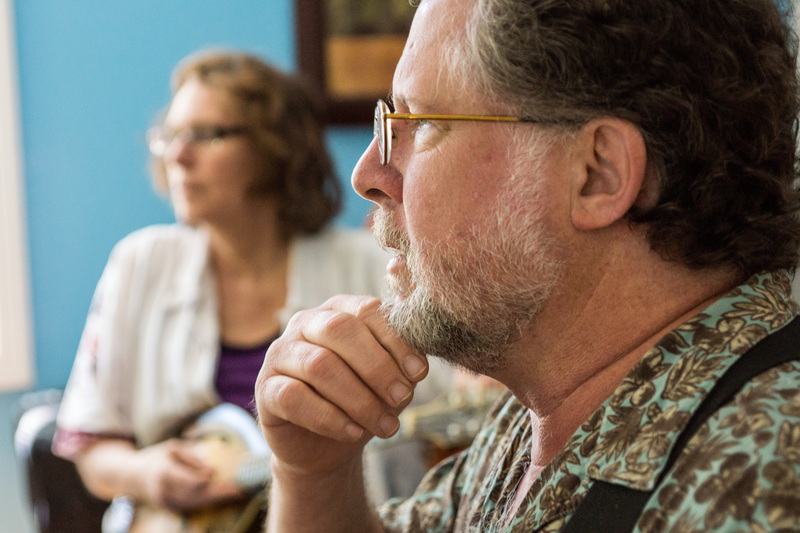 With their folk-style music, with heavy bluegrass and country influences, the Austin Lounge Lizards have been crooning hits for the politically aware for over thirty years. They have won an impressive five Austin Music Awards, been featured in the Michael Moore film Sicko and even been featured on NPR’s Morning Edition. The Lizards were born by happenstance when Card and Deisler, both history majors, met at Princeton in 1976. “We were hanging around with [Hank’s] old girlfriend from Oklahoma City one night and we wrote a song and decided to record it, and I discovered that Hank sang really well, and had a good instinct for harmony singing,” Deisler said. 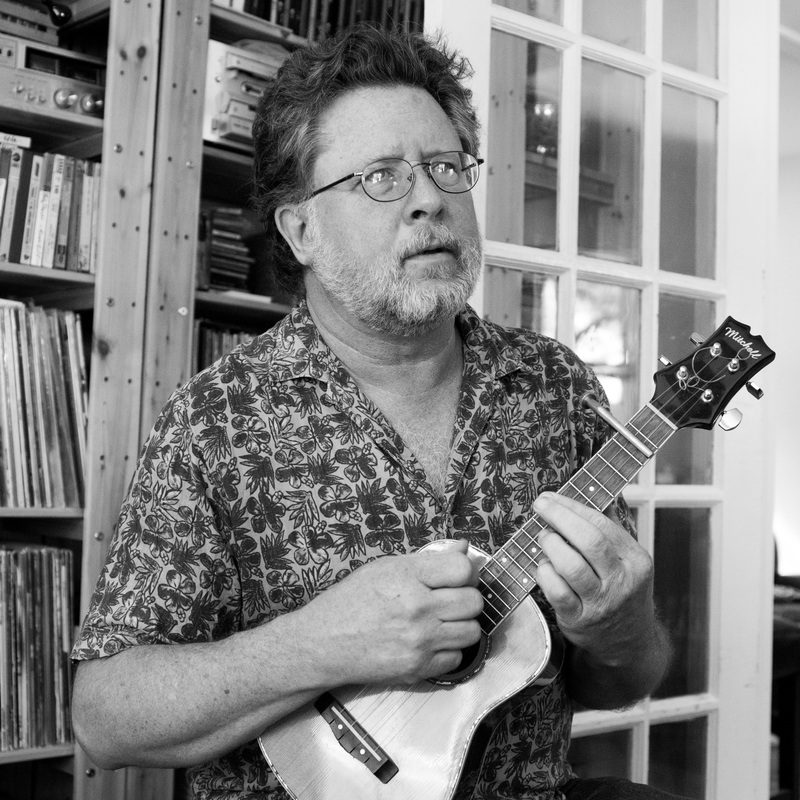 Conrad Deisler is one of the founders of the Austin Lounge Lizards and plays the guitar and mandolin. The pair, both heavily influenced by George Jones and Frank Zappa, began songwriting and eventually played a few gigs at the university. 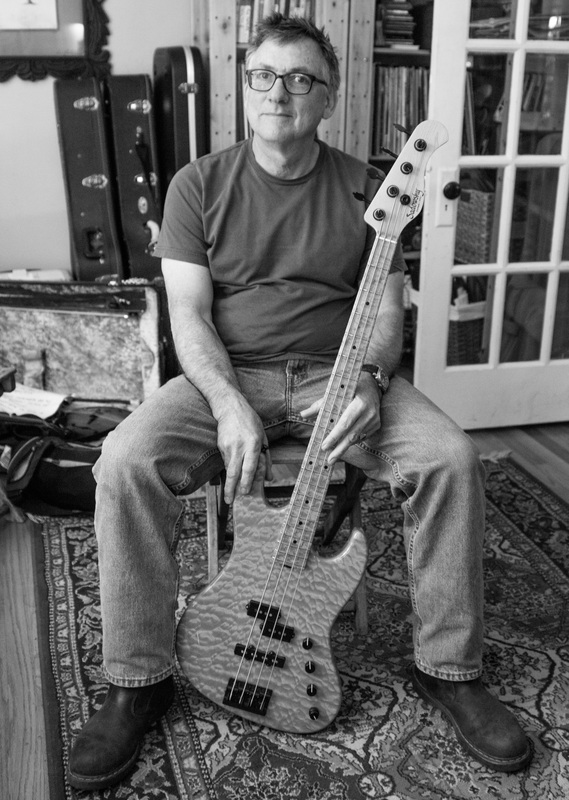 “We had a sort of, progressive country they called it, band at the time. We played Jerry Jeff Walker, Willie [Nelson], that kind of stuff,” Card said. Upon graduation, they headed their separate ways. Eventually though, they would meet up again in Austin in 1980. Their original material was a hit. 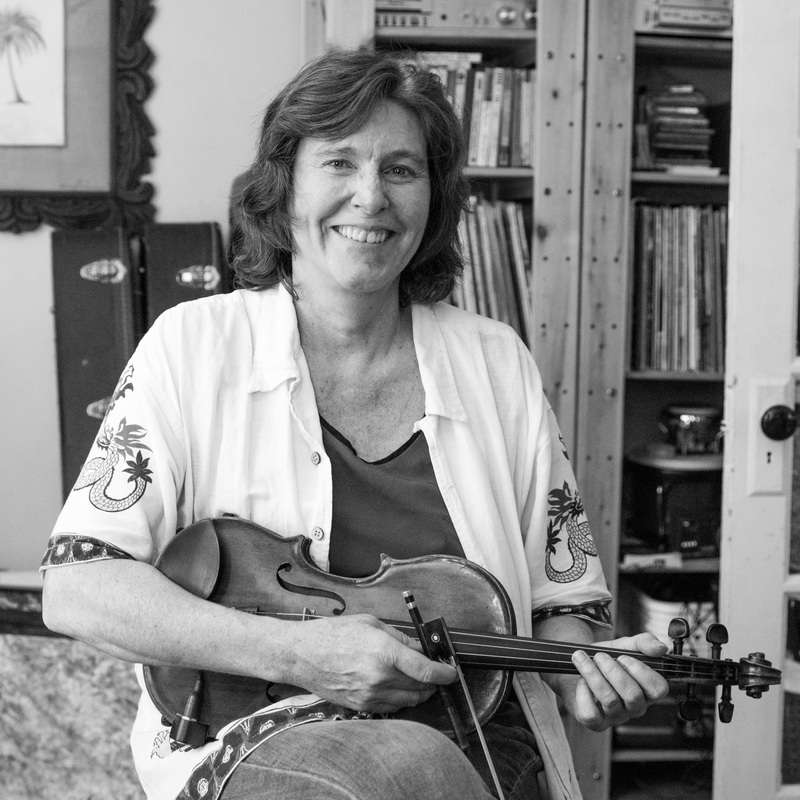 Darcie Deaville joined the band around 2007 and plays the fiddle and the mandolin. 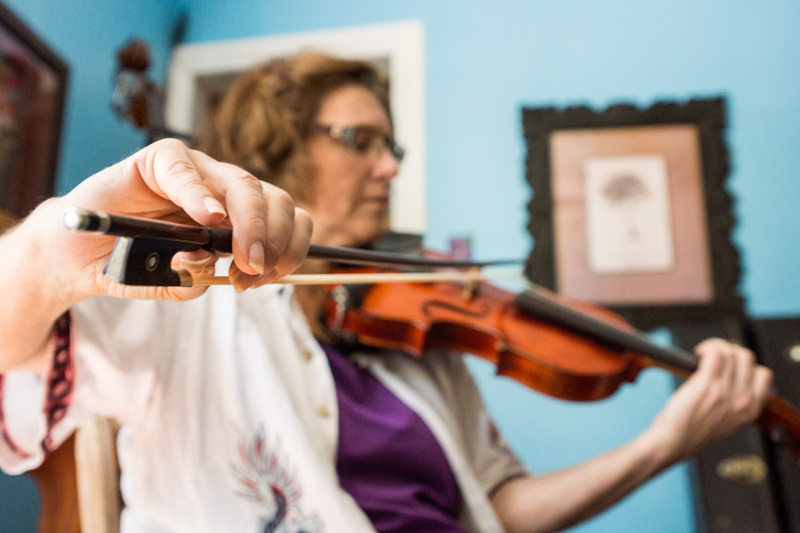 About thirty minutes into the rehearsal, a woman walks through the front door and makes herself comfortable in her spot in the tiny practice room. 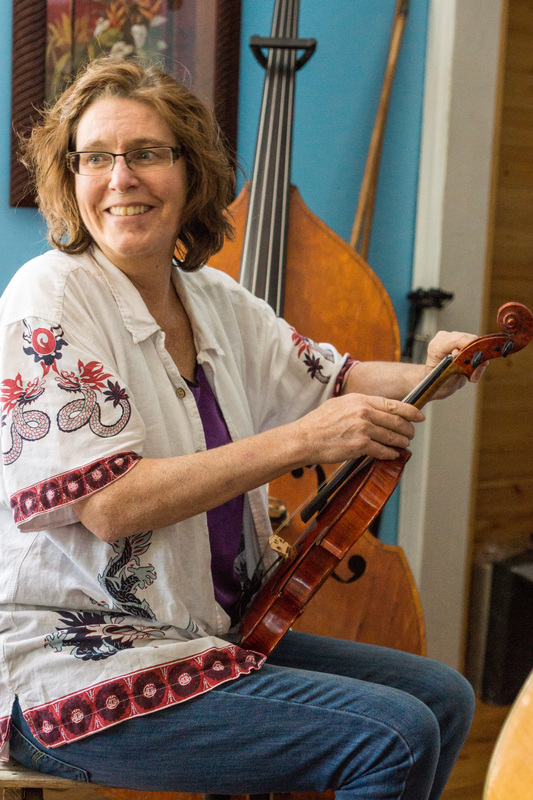 She’s Darcie Deaville, the token female in the ensemble who plays fiddle, mandolin, and provides her voice for vocals. Up until original Lizard Tom Pittman retired in 2011, the band was a five-piece harmony. While Card, Deisler and Pittman remained constants, the other two positions in the ensemble had various musicians step up to complete the group, which Boston Globe once dubbed “America’s pre-eminent Country Weirdos.” After Pittman’s retirement, the Lizards decided that he wouldn’t be replaced on the banjo, and have continued instead as a four-piece harmony. 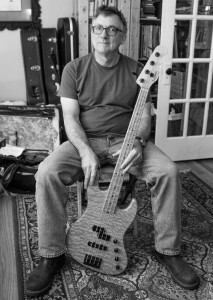 Bruce Jones, the bass player, began playing for the Lizards five years ago. Deaville and Jones are the newest members, but you couldn’t tell when watching the band perform. During rehearsal, the group performs songs from a variety of their 10 albums (“but one’s an EP”), without a hitch. 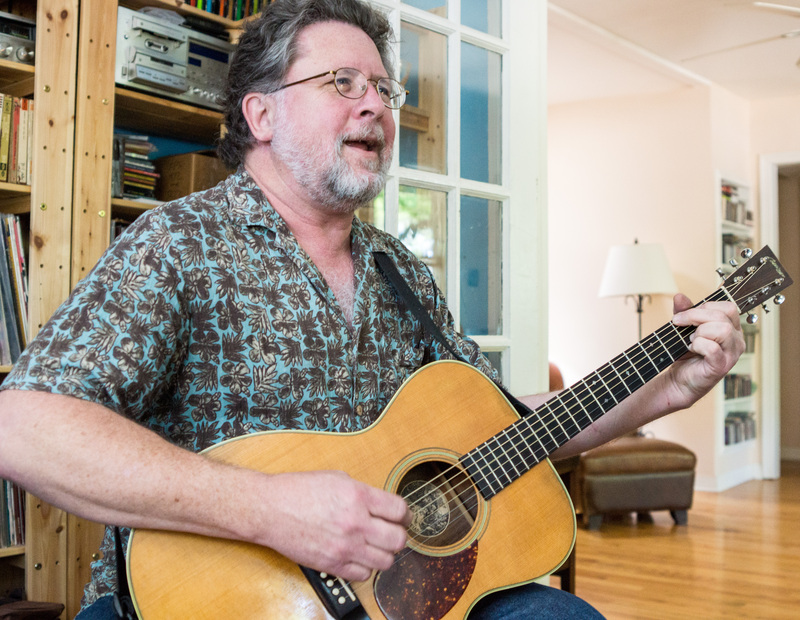 The Austin Lounge Lizards have been in business for 34 years, since 1980. In addition to personal pieces, the Lizards’ unique style of songwriting has attracted the attention of more than just bar-dwelling fans and festival attendees; it has won over consumer advocacy groups. In the early 2000s, the Lizards were commissioned by the Consumer’s Union, to write three songs for the socially conscious. The Consumer’s Union would give the band a topic, and they would all work together to write a song. “The first one we did was ‘The Drugs I Need’ and it was an aid the Consumer’s Union had at the time to try and make the legislation more transparent about the pharmaceutical companies and the money they spent to develop drugs and the prices,” Deisler explained. Henry Card, who goes by “Hank,” is the other remaining founder and lead singer. He plays the rhythm guitar. The Consumer’s Union would typically also turn these songs into cartoon videos, which they would spread to further the message of their political purposes. According to the band’s Facebook page, a national consumer-advocacy group has commissioned another hit from the Lizards aimed at car manufacturer’s reckless retail habits. “Origi-lizards Hank Card and Conrad Deisler are already in the final stages of fine-tuning the song, which urges the automotive industry to “Turn It Over Again” – referring to a new leaf, as well as one company’s recent high-profile ignition-switch issues,” details the page. But getting this song out to the band’s many fans may prove to be more difficult. 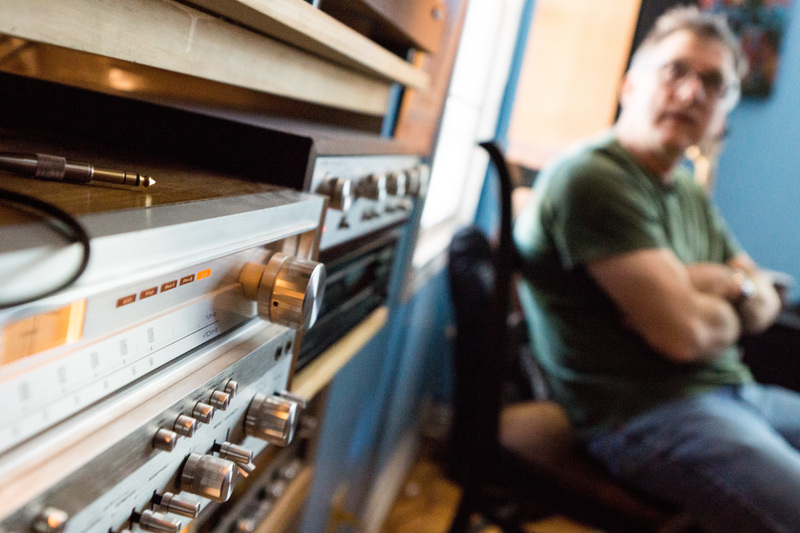 Now, in a time where aspiring artists are seemingly forced to resort to reality competitions or YouTube videos to attempt to have their voices heard, Card said that getting records played on the radio, even local niche stations, is shockingly more difficult than when the band first began in the early 1980s. 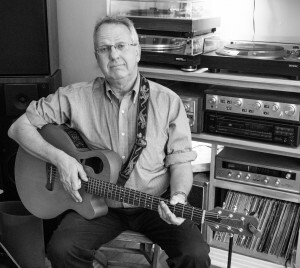 Card credits local deejays like Larry Monroe, a former beloved KUT and KDRP deejay who died earlier this year, with the band’s ability to make it to the air waves at all. While the band may not have as much support from local deejays, they maintain the adoration of fans nationwide and in Canada. They just returned from a four-stop tour in California. 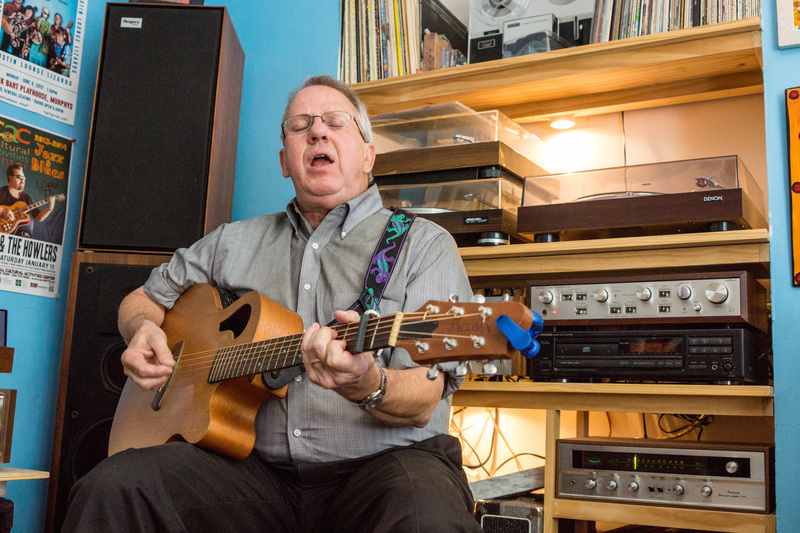 The Austin Lounge Lizards practice in a tiny room in Jones's house, filled with old records. Until about two months ago, Jones also was a licensed professional counselor working with criminals, probationers and parolees. He's now retired. Deaville is also involved as an original cast member in a play that recently traveled to China. Traditionally, the Lounge Lizards have been a five-part band, but in recent years, it has become a four-part band. Card, who is also an attorney, is one of the main songwriters. Deisler, a lot of the time, works with Card to come up with original songs. The Lizards are known for their satirical, political songwriting. Deisler also attended law school with Card. Jones used to play - and sometimes is still involved with - another band called Omar & The Howlers. 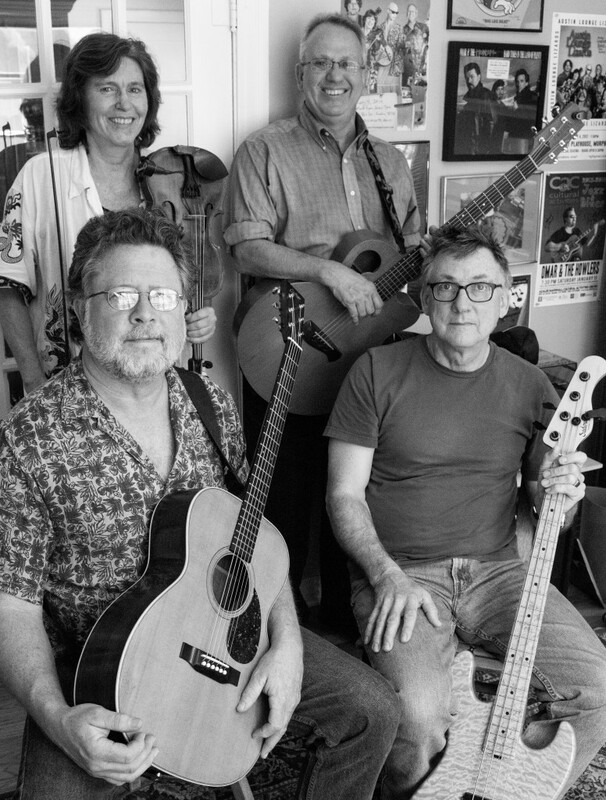 The Austin Lounge Lizards are currently working on new songs... including one about Congress. Card said that he hopes fans of the Lizards continue to be amused and uplifted by the music he helps create. 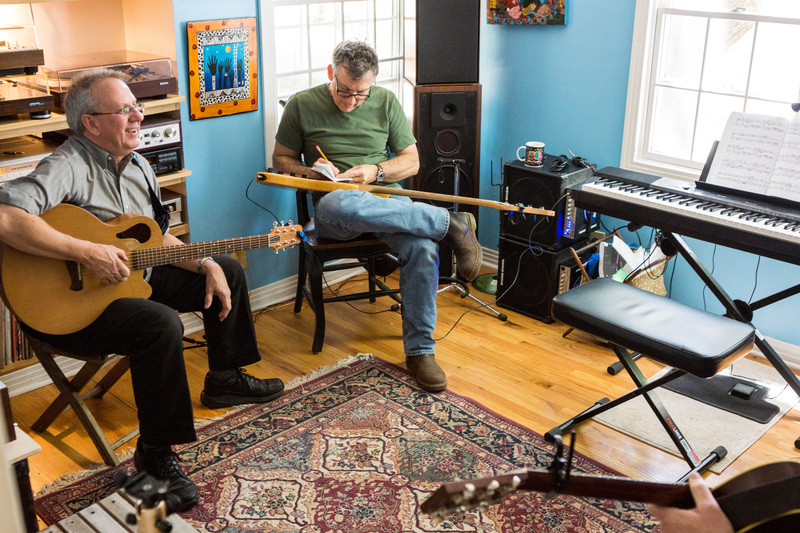 Some members are nearing their 60s, but it is clear in the record-lined rehearsal room that the Austin Lounge Lizards are here to stay. They still tour, play local gigs, and even sometimes will treat the lawyer friends from Card’s day job to a performance. Card and Deisler are even working on new songs.